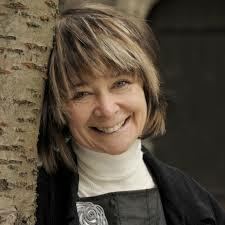 Devotees of the Readers and Writers Festival will remember Sarah Dunant from the 2009 festival. The noted British author of thrillers and historical fiction is returning to Denman this July. She is the latest addition to an already talented line-up of writers. Normally, we bring writers from BC and other parts of Canada to the annual festival. However, Sarah discovered she would be in BC in July and asked if we’d like her to bring our festival audiences up to date with her writing and life over the last 9 years. It was easy to say yes! Sarah Dunant has written scores of books, starting with a series of contemporary thrillers, mostly featuring women protagonists – I’ve read one of these, “Mapping the Edge“, and it was a page-turner. After an inspiring visit to Florence about 20 years ago, her writing moved to a new series of historical novels focused on the lives of women in the Renaissance period, such as “The Birth of Venus“. These have been hugely popular, as well as critical successes. Her most recent book is “In the Name of the Family“, the story of the Borgias, one of history’s most infamous families. She has also developed a keen interest in art and architecture from that exciting period of European history, and her presentation at the Denman Festival will not only focus on her latest books, but also on her knowledge of buildings and paintings from the Renaissance. When she first came to Denman, she enthralled our audiences with what the UK newspaper, the Observer calls her “flawless historical scholarship and beguiling story-telling”. She’ll likely do the same again in July.